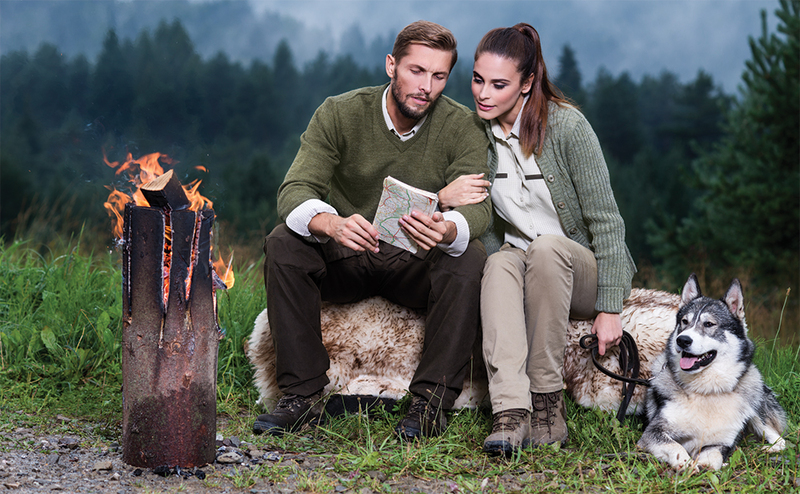 A sweater made of a durable jersey in olive colour blend. Finished with orange jersey internal back yoke. Functional hunting trousers designed for active hunting in changeable weather conditions. Different types of fabric which have been used vary in such parameters as breathability, water resistance and durability depending on active areas of the body. Such a design ensures maximum comfort and thermal control. A warm sweater with elevated collar, decorative braids woven at the front. The yarn with addition of alpaca provides exceptional softness. Very comfortable trousers combine the comfort of viscose, durability of polyamide and elasticity of Spandex. This unique fabric content and functional cut cause that the pants are lightweight, elastic, durable and very comfortable during long treks. Hunting style ladies’ shirt. Elegant bright checked pattern. Thanks to the addition of Modal it is exceptionally pleasant to the touch and effectively extracts moisture to the outside. The shirt protects from harmful UV radiation. Sleeves may be fastened to epaulettes when folded. Elegant suede edging. Warm and elegant sweaters in conjunction with pleasant to the touch shirts create set that might be used even for less formal occasions. Durable, comfortable, quick-drying trousers may be used not only during intense activity in the field, but they can also be a part of the informal dress code.